Alma Thomas is renowned for her brightly colored abstract works that seem to dance across canvas and paper, but how did she develop that iconic style? Two paintings that reveal her stepping stones toward abstraction are featured in our October 5 sale of African-American Fine Art. 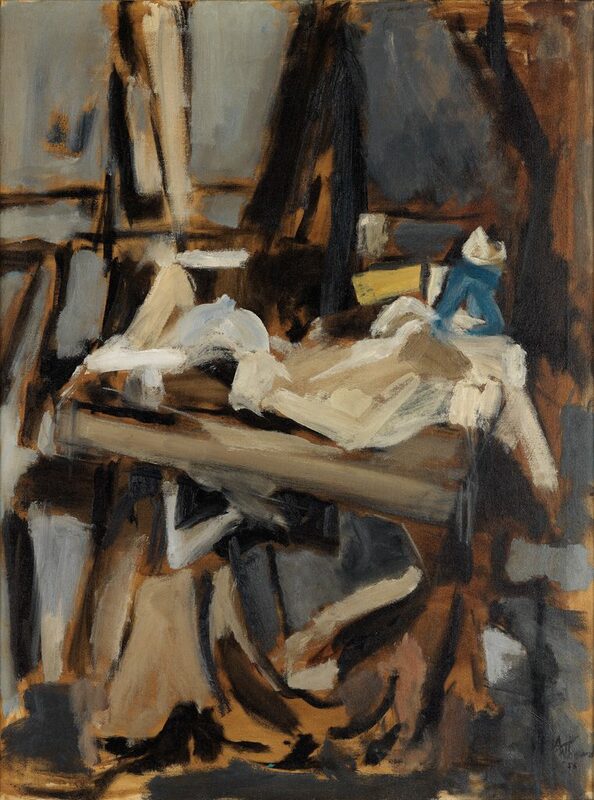 Etude in Brown or Saint Cecilia at the Organ is a significant and early oil painting by Thomas — a large, transitional work from the mid- to late 1950s, when the artist was developing her abstract voice. 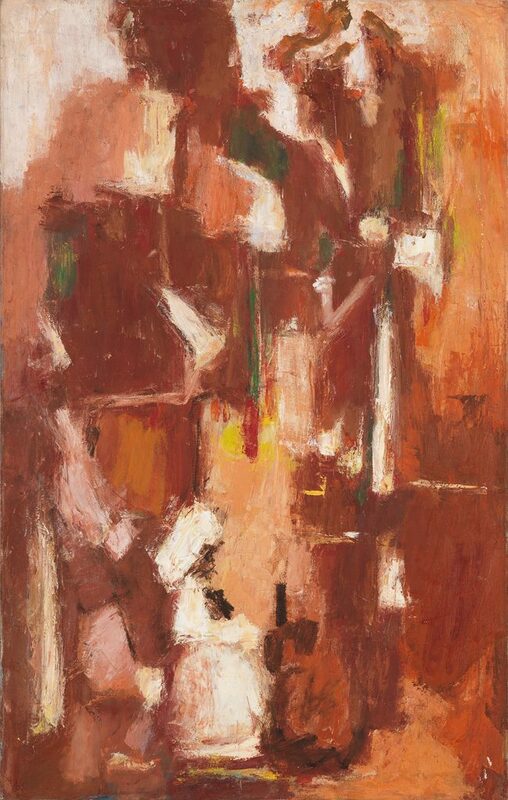 Lot 43: Alma W. Thomas, Etude in Brown (Saint Cecilia at the Organ), oil on canvas, circa 1958. Estimate $75,000 to $100,000. In Etude in Brown, Alma Thomas’s expressive composition is almost — but not completely — abstract. While the composition is dominated by a towering abstraction of warm colors broken up by passages in white, the small seated figure of Saint Cecilia appears in the foreground. Alma Thomas studied with Jacob Kainen, an Abstract Expressionist painter and printmaker, at American University in the fall of 1958, and exhibited her work in Contemporary American Painting, part of the College Arts Traveling Service at Howard University Gallery of Art. Lot 42: Alma Thomas, In the Studio, oil on canvas, 1956. The second transitional painting by Thomas in the upcoming sale, In The Studio, shows another side of her development as an abstract painter. Stacked canvases and papers on a table are reduced to a compressed composition of shapes with a limited palette. Alma Thomas, Untitled (Abstraction in Blue), oil on canvas, 1964. Sold February 2011 for $36,000. 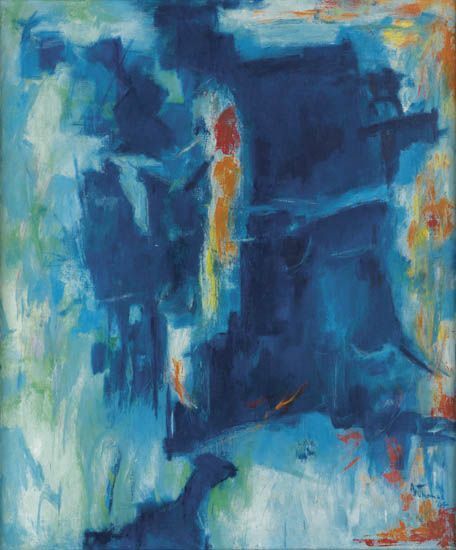 Untitled (Composition in Blue) is a dynamic Abstract Expressionist canvas and an excellent example of Thomas’s work from the early 1960s, when her oil paintings were characterized by saturated color and punctuated by rapid brushstrokes and palette knife markings. 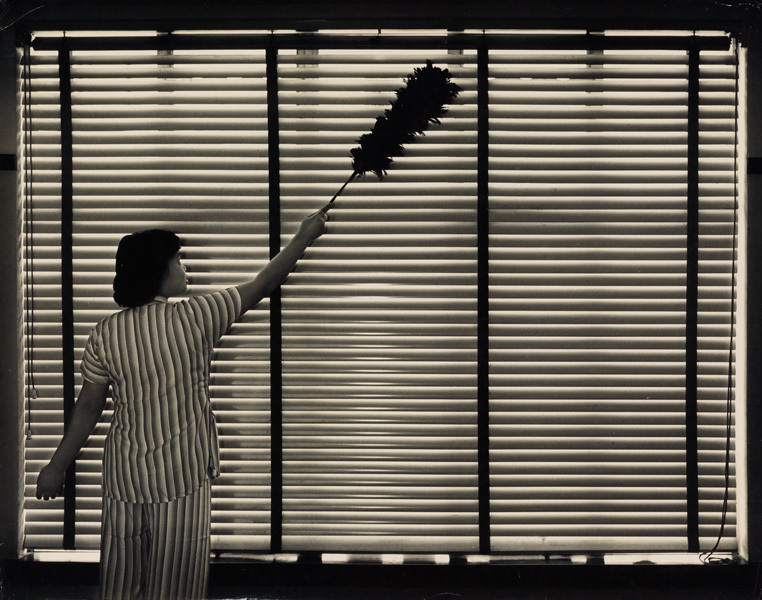 She turned her attention to painting full-time in 1960, at the age of 69. In 1964, she a severe attack of arthritis and was forces to step back from her work — an interval that led to her “mature” style and first retrospective at Howard University in 1966. Alma Thomas, March on Washington, oil on canvas, 1964. Sold February 2012 for $72,000. This important Civil Rights painting is one of Alma Thomas’s few representative works from the early 1960s. 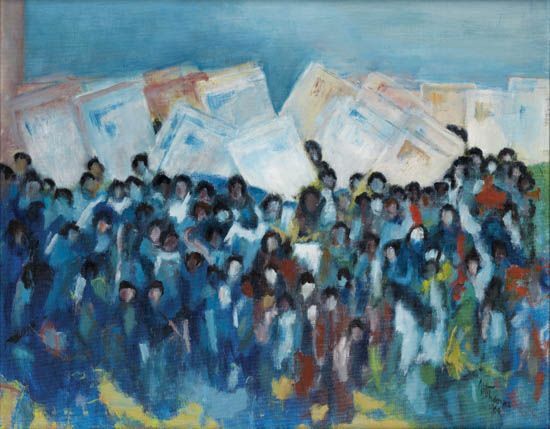 Thomas incorporates her bright palette of primary colors with a flattened, abstracted view of the crowds and their placards. She participated in the March on Washington on August 28, 1963, which clearly made a lasting impression, as she returned to figuration to record the historical event in her work. The painting did not travel to her 1998 Fort Wayne Museum of Art retrospective, but it was illustrated in the catalogue. 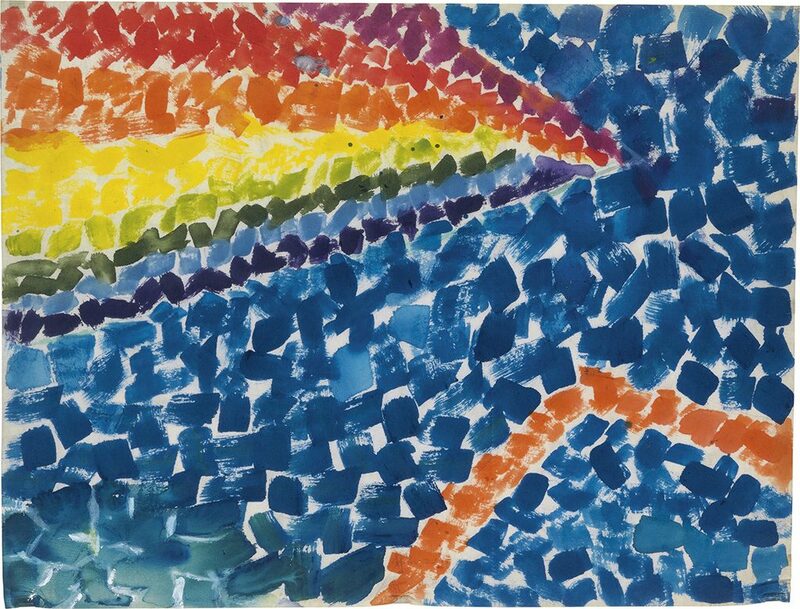 Alma Thomas, Untitled (from the Space Series), watercolor on cotton batting, circa 1969-72. Sold October 2014 for $32,500. Thomas began her Space Series of abstract paintings in 1969, inspired by NASA and the televised images of the Apollo missions and moon landings. In 1970, she exhibited both her Earth and Space paintings at the Franz Bader Gallery, Washington, D.C., and the following year, at the Carl Van Vechten Gallery of Fisk University, Nashville. Alma Thomas, Fall Atmosphere, acrylic on canvas, 1971. Sold December 15, 2015 for $87,500. 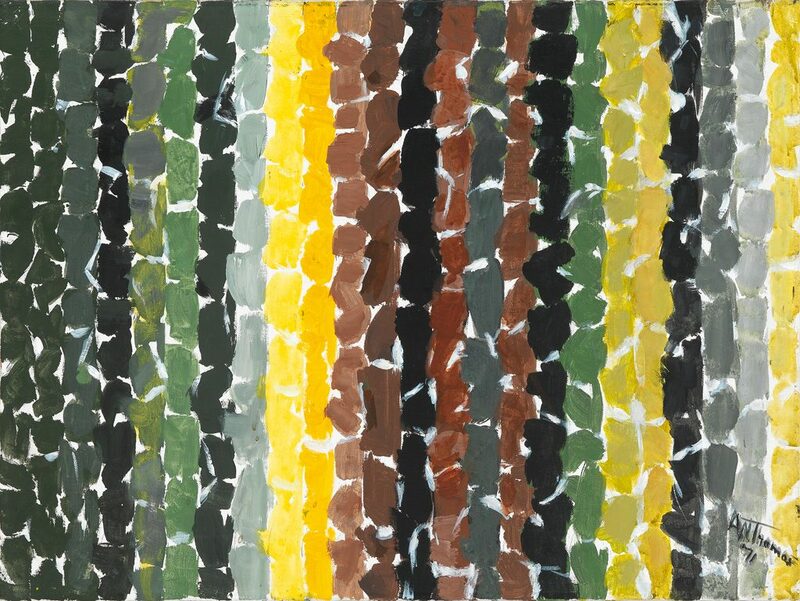 Fall Atmosphere is a wonderful example of Alma Thomas’ vertical stripe abstractions from the late 1960s and early 1970s. This study of light and color is distinguished by its palette of beautiful fall colors. A similar subject is found in the larger painting Breeze Rustling Through Fall Flowers, 1968, at The Phillips Collection in Washington, D.C.
Browse the catalogue for more.